Google [GOOG] has finally unveiled their Google Phone that everyone has been talking about over the last couple of weeks, the Google Nexus One. The Google Nexus one is a Google branded Android smartphone, which is made by HTC, it comes with Google’s latest version of their Android OS 2.1, which has a range of features, and a 3D framework. Hardware wise, the Nexus one has impressive specifications, processing comes for a 1GHz Qualcomm Snapdragon processor, it features a 3.7 inch AMOLED touchscreen with a resolution of 480 x 800. On top of that the Google Nexus One has a five megapixel camera with a built in LED flash, and the camera is also capable of recording MPEG-4 video and has a one click feature which will let you upload your videos to YouTube. Other specifications include a trackball with a multicolor LED, that displays different colors for different notifications, there is also a built in compass, plus GPS, stereo Bluetooth, two microphones, a 3.5mm audio jack, plus a range of light sensors and proximity sensors. The Google Nexus One also features a built in accelerometer, and it comes with a 1400 mAh battery that will give you up to five hours of web browsing using 3G and seven hours of talk time with 3G. 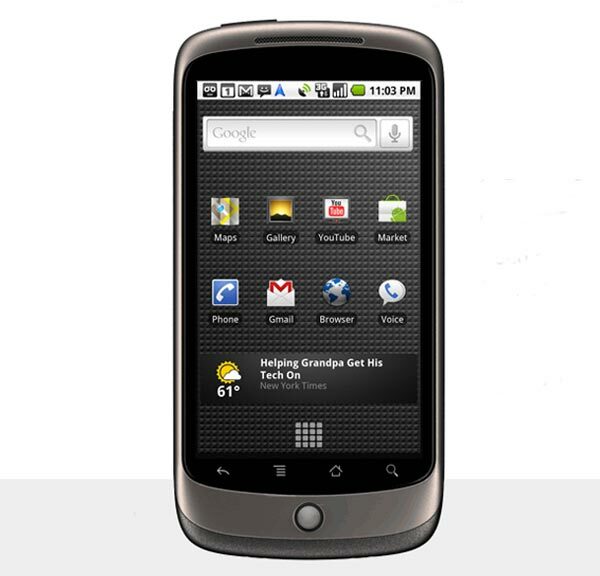 The Google Nexus One is available unlocked so that you can use it on any network for $529 in the US, or it is available with a two year contract with T-Mobile for $179.99, it will also be available on Verizon Wireless as well sometime later this year. There are no details as yet on when we will see the Nexus One in the UK and the rest of Europe, we will keep you updated as soon as we find out.